Am I seeing this incorrectly? 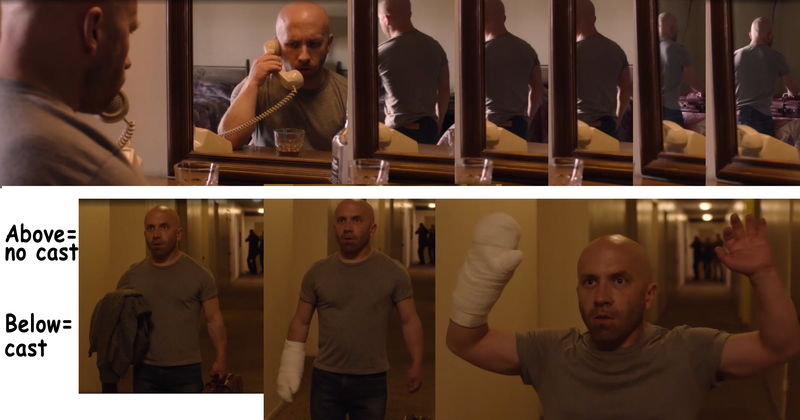 When Ike is on the phone leaving the "Message for JT," and later in the hallway, we can see it's his right hand and forearm which are bandaged/in a cast. That makes sense. When he attacked Dougie Cooper, his gun was in his right hand. But after he hangs up the phone, we see him in the mirror as he goes to the bed to get his things before going into the hall. -- His left arm is bandaged in the mirror. -- Isn't it--? I think there's something with his arm. The bandages are quite large and there was some kind of moan coming from it when he was arrested. I thought the moan was Ike in a sort of "oh s#!t" moment. Will have to re watch! Yeah, but his mouth doesn't move and the focus is kinda on the arm (to me at least). There is no continuity error, his right arm is bandaged. The moan clearly comes from Ike. It's the easiest thing in the world to make a noise like that without moving the lips. Thanks for the replies - re: the groan - I saw there's another topic already posted on that. Some people are interpreting the groan as coming from the arm, but it didn't hit me that way. Seemed like it was a muffled closed-mouth groan from Ike, as SamXTherapy said. But I'm still not getting it - I've looked at the scene several times, and it's still looking to me that the bandages switch arms when we're looking in the mirror. Maybe I'm shifting into another dimension as I watch? - That's a possibility!--- SamXTherapy, you're positive the bandage stays on the right arm? You've looked at that moment again? Yup. You see a reflection of something and it's reversed, right? So, his right arm, as viewed in the mirror, will show up on the left, if you see him from the back. You are so used to thinking that the right arm will show up on your right in a mirror, that seeing it the other way round is throwing you out, because you don't account for the fact you're seeing him from the back. Trust me on this, look at it again and you'll see I'm right. If it helps any , stop the action right there, then mentally rotate Ike 180 degrees and you'll see that the reflection of his right arm is exactly where it should be. The disappointment moan clearly comes from Ike, it sound very similar to the sound he made when he noticed that his "Spike" was bent! A mirror's reflection reverses the horizontal axis but not the vertical. Whatever is on our right side is also on the right side of a mirror. Over his shoulder, in the mirror we see Ike on the phone. We can see his right arm is hidden and he's using his left hand to drink, even though he's right handed. He gets up and we keep watching him in the mirror. As he goes to the bed, we an see his left arm isn't bandaged, as expected. BUT - his right arm isn't bandaged/in a cast either. Enlarge this so you can take a good look at Ike's right arm. When he's still in the room, no costume piece was used on his arm. There was no cast or bandage. When he first steps in the hall, his jacket is draped over his arm so we can't see the cast. When he's cornered by the police, only then is it revealed that he's wearing a cast. Before seeing it, we were suspecting he's probably wearing a cast - then it's visually confirmed. To keep our first view of the cast to take place when he's trapped in the hall, a cast wasn't used in the motel room, to avoid even a glimpse of it. It was a small cheat to make sure the reveal didn't happen until he raised his arms int he hall. Mystery solved - at least to my satisfaction! Is watching Twin Peaks: The Return making me more obsessive than I already was? Maybe so! Spike's clearly had a really bad spot of luck this week. First he breaks his favorite murdering tool by bending it all out of shape, then the sheep that was supposed to be an easy target turns into the reincarnation of Melvin Purvis, James Bond and Jackie Chan and then finally Las Vegas' finest capture him just as he leaves his hotel room. Makes one feel almost sorry for the pint-sized psycho. P.S. In the last two shots in the top row of my composite photo, we can even see Ike's fingers.